Millions of Americans head out on vacations all over the country every year, and many of them will bring pets along when they do. Pets are a part of the family and have their own special needs. When you head out on your RV vacation this year, make sure you follow these tips to keep your pet healthy and safe so that you all will have as much fun as possible by avoiding unnecessary complications. Begin your pet planning at least one month prior to departure date. Some of the initial steps you should take to keep your pet safe and secure need to be done in advance. Before you even get the RV gassed up, check over your pet’s vaccinations and ensure they are up-to-date! Checking on this early allows enough time to schedule an appointment with your vet and take care of any vaccinations that need to be addressed. Another vital step before leaving home is to ensure that your pet’s collar fits and that it has an accurate ID tag attached. Many families do not have pets wear collars while at home, but they are vital while out and about on vacation. An exterior ID tag is also vital. Even if your dog or cat has an implanted ID chip that can be scanned at a veterinarian’s office, you won’t necessarily have to wait for an escaped pet to show up at a vet if it has an ID tag. Whoever spots your dog can call you right away to let you know that your missing pet has appeared. As your travel time arrives begin writing down a list of all pet traveling necessities. Pet carriers and extra leashes are a must! Even if you’ve planned on having your pet ride in the cab of your RV for the entire trip, you should still bring a pet carrier with you. You will want to take special precautions to make sure that your pet is secured whenever you stop in a new location. Pets can become easily stressed in new environments and the comfort of their pet carrier provides a safe place for them, especially if you are leaving them in the RV while you’re out site-seeing. You don’t want your beloved pet running off with their temporary neighbors or getting into mischief while you’re away! It is highly recommended to keep an extra leash on hand per chance one gets torn, soiled, or destroyed in some way, you’ll be ready to stroll without any delay. If you are traveling to a warm location, remember to provide plenty of water for your pet, preferably in a self-filling container. Strap the container to one of the walls of your RV so that your pet can’t accidentally tip it over. Also, think twice before leaving your pet alone in your RV in warm weather. Without air conditioning turned on, an RV could potentially heat up inside to the point that your pet starts to get dehydrated. When camping with hook-ups, keeping the air conditioner running shouldn’t be a problem. Summer is almost over, so have fun on your last RV trips of the summer and any trips you plan to take this fall. Take your pets along to make the journeys even more memorable, but follow these tips to ensure your furry friends are having a great time, too! Pets enjoy being with you on vacation and would fair better by going with you rather than being kenneled without you. Try it and prepare yourselves for a successful trip! Photo Credits: Owner with pet by Terry Bone and El Monte RV at Grand Canyon by Grand Canyon National Park. Both are licensed under the Flickr Creative Commons license. Benoit Denizet-Lewis, a writer with The New York Times Magazine, is traveling around the country for four months in an El Monte RV with his dog, Casey, for a book he’s researching about dogs in America. He’s driving some 15,000 miles and meeting interesting dogs and dog people in some 35 states, including sled dogs, bomb-sniffing dogs, shelter dogs, famous dogs, a pet psychic, a man who raises wolves in his backyard, a dog-catcher who won the lottery, and dog-loving RVers. We encourage you to follow Benoit and Casey’s journey at Travels With Casey, and be sure to let him know if you know of any great dogs—or great dog people—he should meet on his voyage. For many, what to do with the family pet can be a big impediment to planning a family vacation. Others simply cannot imagine going anywhere without their four-legged family member. RV Camping can be the answer for both. 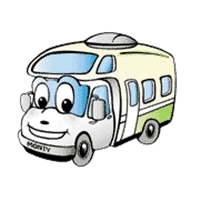 Most RV Rental companies allow you to have pets in their RVs (El Monte RV does). Most RV campgrounds also allow pets. In North Carolina there is even a campground that promotes themselves as a “dog dedicated campground“. Be sure to check them out – Four Paws Kingdom. So instead of wondering where to put your pet while you are away, with an RV the challenge becomes planning a great RV camping adventure because Fido is coming with you. Call Ahead – Call campgrounds ahead of time to make sure they are pet friendly. Make sure to ask if they have any weight limitations for dogs. Vaccinations and Medical Records – Make sure that your pets are up to date on their vaccinations (rabies, distemper, etc.) and have appropriate documentation with you to prove it. It is not a bad idea to also have their full medical record with you and to obtain a number of a local vet at your destination just in case your pet needs treatment. Pet First Aid Kit – Have a pet first aid kit and at least a briefing from your pet’s vet on how to use it, just in case (see here for some pet first aid items). Travel Restraint – Provide a protective travel crate or restraint for you pet so that they do not get hurt in the event of a sudden stop, and so that they will not interfere with the driver. Regular Stops – Plan on stopping regularly when traveling to allow your pet to get some exercise and allow them to relieve themselves (remember to clean up after your pet). A Few of their Favorite Things – Bring some things that are familiar to your pet to help them to feel at home in their home away from home. Identification – Have identification on your pets (tags, implants etc.) to make them easy to identify and you easy to contact should they get lost. Far away from home it would be very easy for your pet to get lost. Clean Up After Your Pet – The single biggest complaint other campers have is pet owners who do not clean up their pet’s “business”. So don’t worry what to do with your pet while on vacation. Take them with you on a fun and exciting RV vacation!